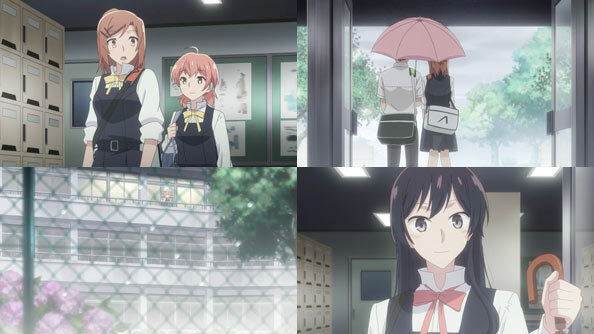 When Neon Genesis shows up at Yuuta, Rikka and Shou’s school—with outside shoes—and risks being reported or escorted away, you know something big is brewing. Akane has dusted off the first kaiju she built to defeat Gridman and souped it up into a kind of mega-mecha-kaiju. She’s also not shy about her role in the kaiju-making. 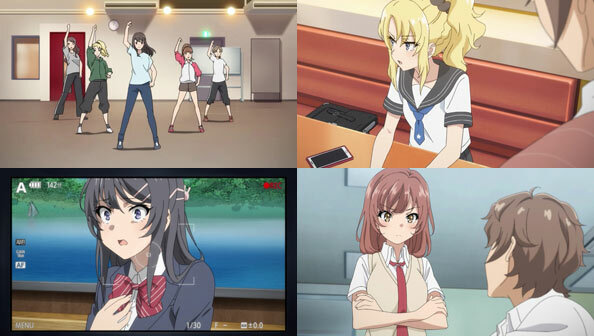 Assuming Yuuta has caught Rikka and Shou up, she tells them upfront that she designed her latest kaiju especially to attack the school’s cultural festival. If they don’t like it, well, they’re just going to have to try and stop her…if they can. 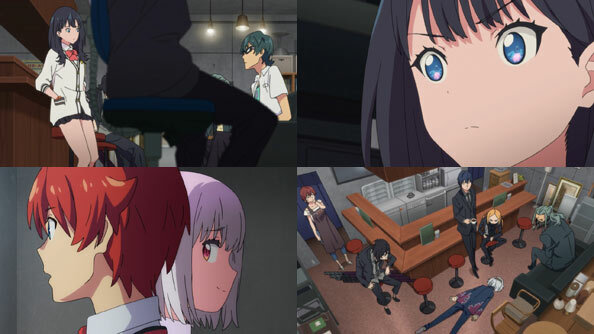 How to proceed creates a rift in the “Gridman Alliance”, which I only put in quotes because in the midst of said rift Rikka calls into question whether it’s an alliance at all, since only Shou has been insisting that’s what they are. 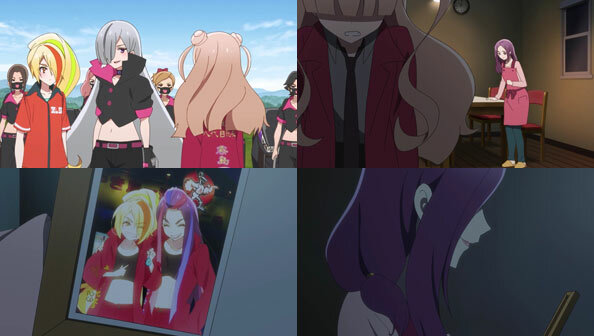 Shou thinks they need to fight at all costs, but Rikka is far more hesitant—Akane is her friend; she doesn’t want to fight her friend. When Shou accuses her of letting her emotions rule, Rikka wordlessly stalks away, and Shou knows he’s stepped in it. 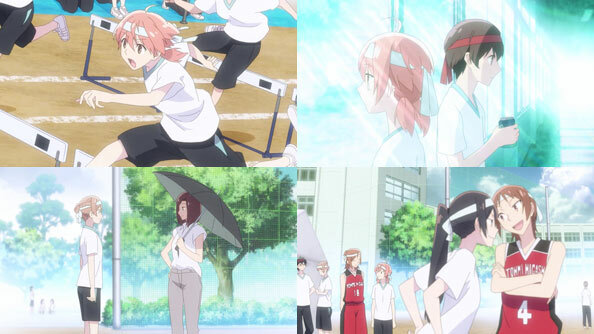 At school, Yuuta and Shou again try to get through to Akane, asking if she’ll have the battle somewhere else where their classmates won’t get hurt. 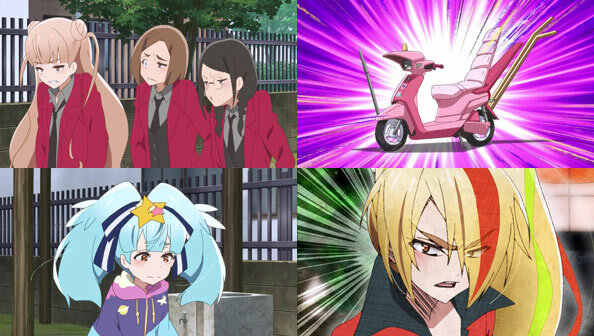 But Akane hates the festival, and suspects the two of them wouldn’t mind if it were interrupted by a cool kaiju battle. There’s nothing left to say; she ain’t budging from her plans. Back at the junk store an extremely hungry, one-eyed Anti shows up looking for Rikka…then passes out. 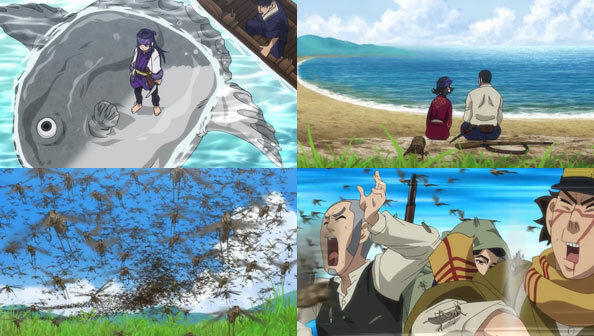 Rikka’s mom feeds him and he goes on his way without incident. 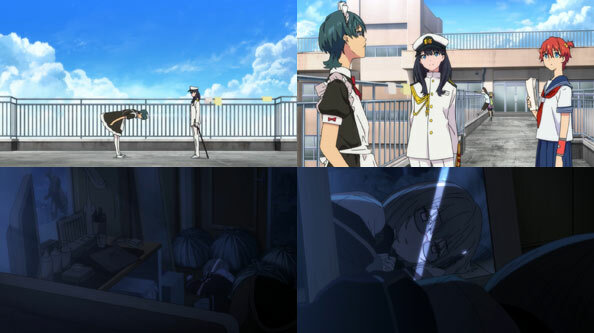 In one of the more unsettling scenes of the entire show, Rikka is alone on a bus with Akane, hoping to change her mind about attacking. 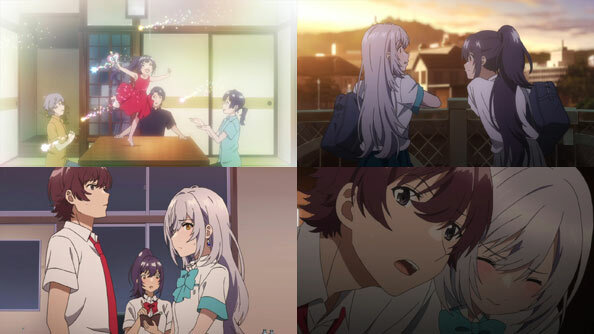 But Akane hugs her from behind, lauding her for being such “a good girl,” and assuring her no matter what she does, Rikka will never hate her, because she’s been “set up from the start” to like Akane like everyone else in the city. Akane is convinced she is a god and there’s no one to prove otherwise, even though I wonder how far she’d get without Alexis’ help. 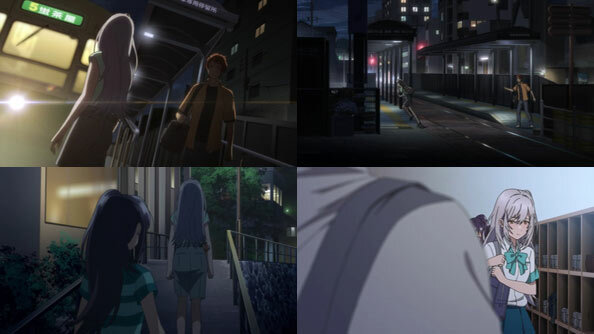 Rikka leaves the bus, no doubt creeped out at the prospect of having been born programmed to be Akane’s friend. 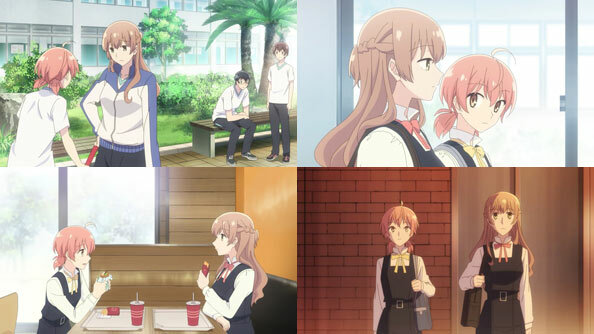 She meets with Yuuta and reveals another reason she’s so upset about the whole situation: she feels she hasn’t contributed anything to the Gridman Alliance. All she feels she’s done is be related to the people who own the junk store and computer. 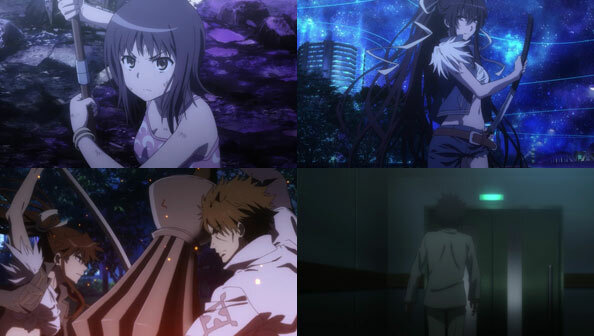 But Yuuta tells her she’s wrong: she has contributed vital moral support throughout this whole ordeal. 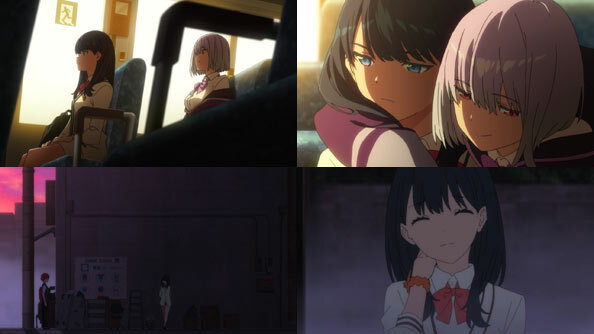 Yuuta draws courage and strength knowing she and Shou are cheering him and Gridman on. 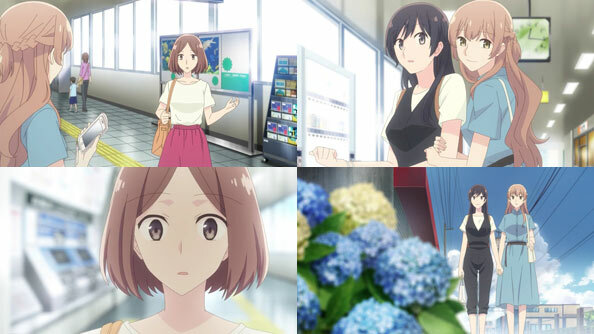 Sadly, when Yuuta tries to use the opportunity to say more about how he feels personally towards her, she interrupts by saying she’ll apologize to Shou tomorrow, saying it would be folly to think Shou would apologize first. 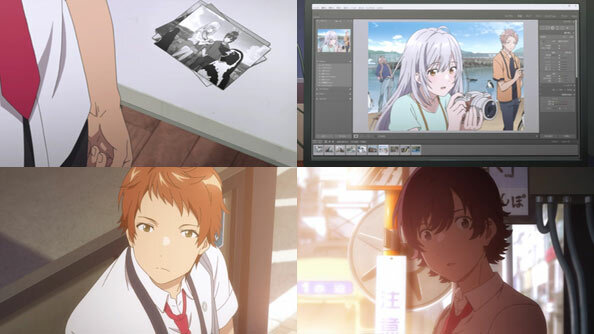 Her mention of “going first” illuminates a light bulb in Yuuta’s head, and suddenly he has the right plan for the festival: Gridman will invade the school first, forcing an evacuation before Akane can mobilize her kaiju. 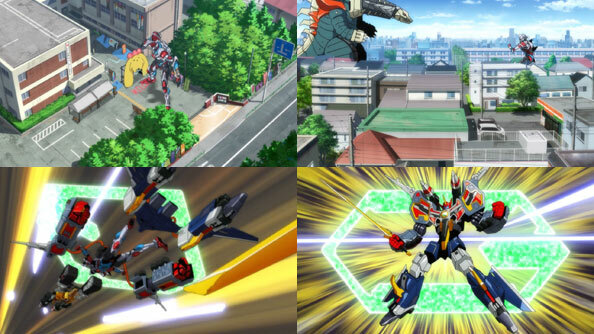 He also has Gridman summoned at only half-size in order to allow all the Neon Genesis to sortie at once and combine to form Full Combo Gridman, who is of a size with Akane’s mega-mecha-kaiju. 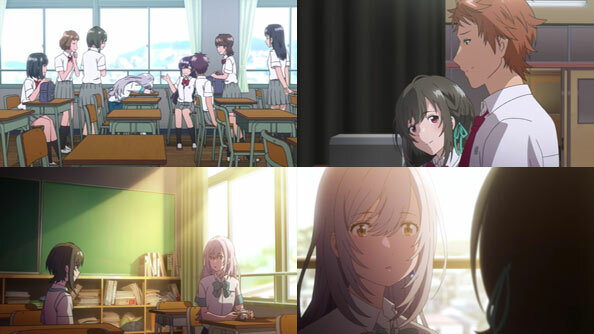 The ensuing battle takes place outside of the school, leaving the festival untouched, which Akane is very upset about, in addition to being outmaneuvered when Gridman appeared first, the opposite of how it’s always gone. 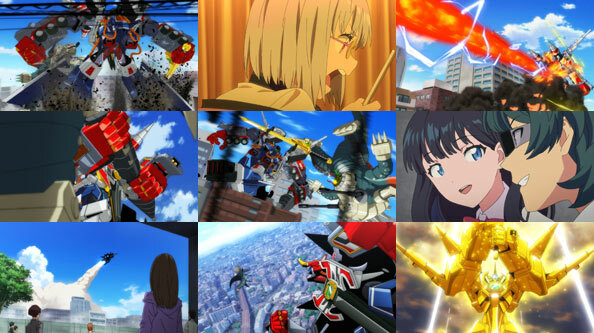 More frustratingly for her, even her new upgraded kaiju isn’t much of a match for the Combo Gridman, who pulls of its head, launches it into the stratosphere, tosses it down to the earth, then cleaves it with a gold-plated finishing move. 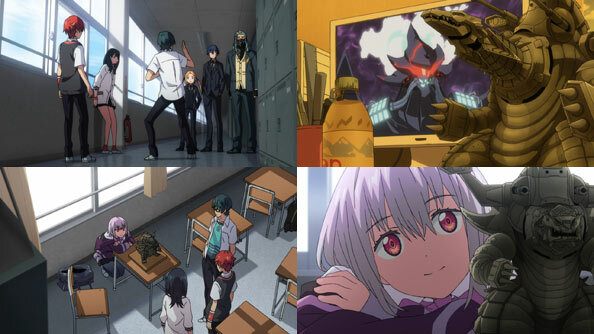 In the midst of the battle both Rikka and Shou are by the computer, watching and cheering Yuuta on as usual, and that’s how they get over their previous rift. 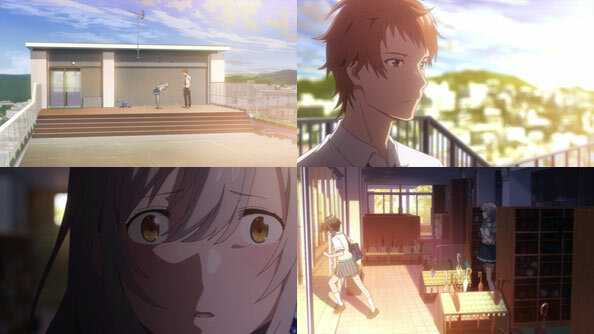 After all, they all tried their best to dissuade Akane and she simply wouldn’t listen. Friend or not, her attack had to be stopped lest more people die. 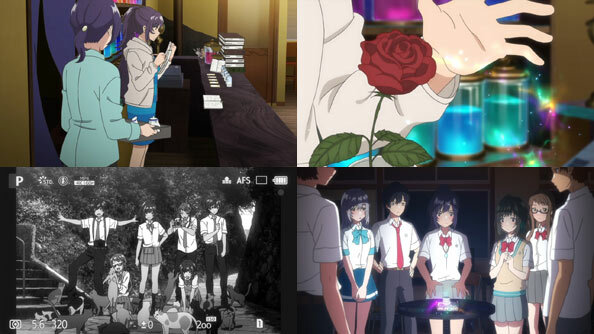 After the battle the three participate in their class’ “reverse gender cosplay cafe”, resulting in Maid Shou apologizing to Sea Captain Rikka while a pleased Schoolgirl Yuuta looks on. As for Akane, who was so sure that this time she’d win and that she couldn’t lose, stays home, lying on the floor of her filthy house, in the dark…a fallen god. Maybe she’s just done with this…one can only endure so many defeats until it’s just not fun anymore. Alexis isn’t mean or anything, but he’s very firm in his belief that she can “do better” than this. 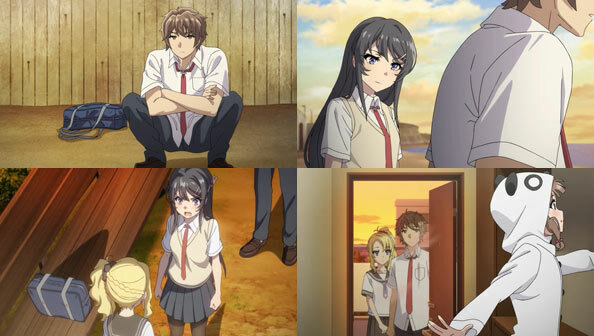 However she feels here and now, Alexis isn’t done with her, and intends to keep relying on her inimitable “talents.” More and more it’s looking like it’s ultimately not the city that must be saved from Akane’s kaiju, but Akane who needs to be saved from Alexis. 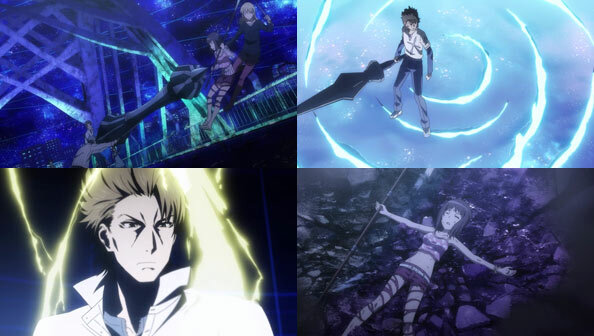 After a quick pep talk from Liena telling him not to remember that Volo’s power comes from his vaunted family line as well as the power of his imagination, and to keep his promise to her to show her everything he’s got, Kirito engages in his real-swords duel with the First Seat. Volo also gives it everything he has, but Kirito remembers he has a family too; not just in Eugeo and Liena but in all his friends IRL. He also draws from the power of the Gigas Cedar his sword is made with, and successfully blocks Volo’s strike. The faculty member ends the fight in a draw, but Volo is satisfied Kirito has been sufficiently chastened for staining his uniform. It’s good to see Volo has a good head on his shoulders and wasn’t going to take things too far. Liena is elated at Kirito’s feat, as are the rest of the assembled students. 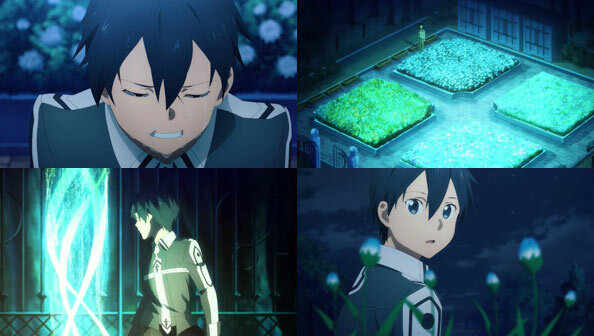 Kirito had come to feel he had a lot in common with the flowers that don’t usually bloom in such a climate; he too is a stranger in a strange land, far from the family that knew, loved, and supported him. 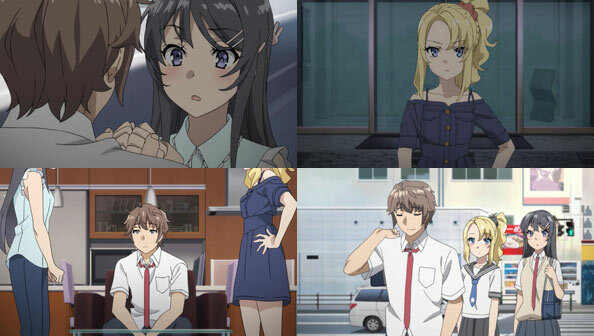 Sure, there’s Eugeo and Liena, but it’s not the same. Then, suddenly, a voice comes out of the air, urging him to ask for the other flowers in the garden to aid him in restoring his plant. They answer the call and send some of their life energy to the ruined planter, resurrecting the buds. 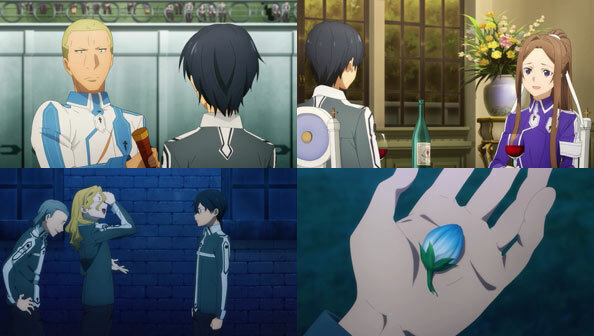 Liena, having both learned from and been inspired by Kirito’s previous fight with Volo, manages to dig deep and defeat him to graduate as First Seat, and thanks to Kirito learning something new about the world he’s in, he has a bouquet of flowers from her homeland waiting for her. 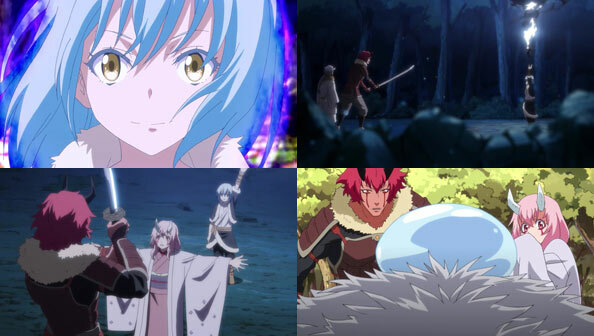 Liena, Volo, and the other elites graduate, and Kirito and Eugeo become Elite Deciples themselves, complete with cute Novice Trainee pages in Tiese and Ronie. 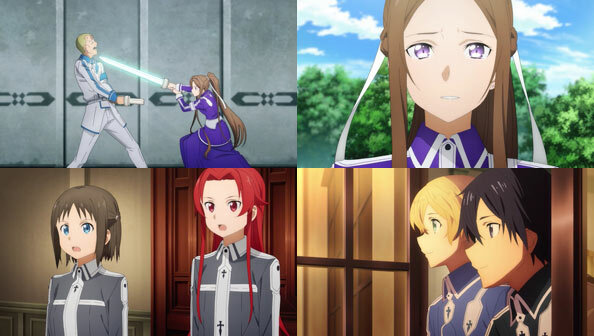 Eugeo may tell the latter that Kirito will be nothing but trouble, but the other side of the deal is she gets to be the first artificial fluctlight trained in his unique Aincrad Style. 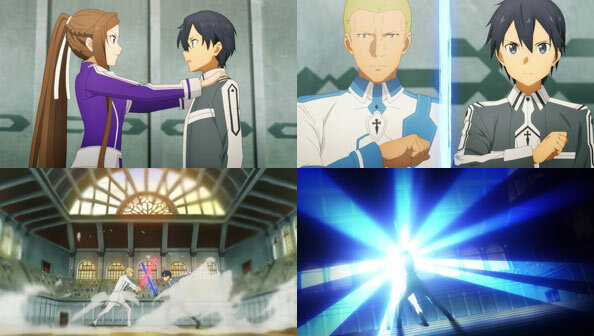 Meanwhile, Kirito and Eugeo, after going at it like an old married couple, keep their eyes on the prize: Alice’s most likely whereabouts, the grand white tower in the center of the city. Swordcraft Academy may be fun, but it’s only a stepping stone. 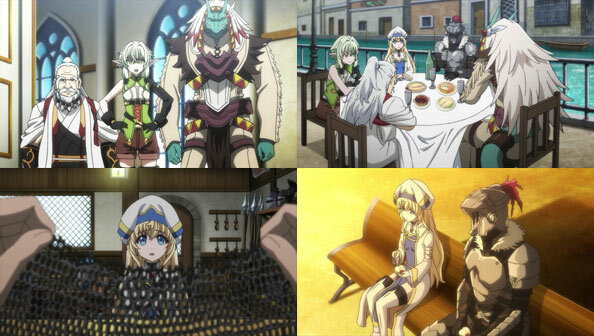 Goblin Slayer is Resurrected by a miracle that requires him to share a bed with a virgin—in this case, the Priestess. 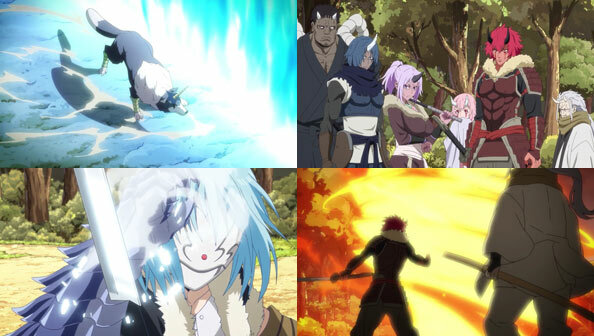 While he’s out, he remembers his harsh but fair master who taught him how to slay goblins, breaking him down then putting him back together into someone who won’t freeze and do nothing, but act when action is needed…even if it kills you. Or, in GS’ case, almost kills him. The miracle works, and we get our first look at a maskless, armor-less Slayer, although his eyes remain obscure both in flashback and present. The Sword Maiden pays him a visit (I imagine it’s her bed he and Priestess are in), but she couldn’t be the virgin the miracle needed, thanks to the Goblins. She confides in him how even though she defeated the Demon Lord, she remains scared to death, and in need of people to help her overcome that fear. We’ll learn that that constant fear is something GS shares. Dwarf, Elf, and Lizard reunite with GS and Priestess and they go into town for their first meal since GS went down; a meal they promised to have together. GS and Priestess then split off and head to the shops. Priestess could easily replace her damaged chainmail, but for her its sentimental value vis-a-vis GS outweighs the difficulty of repairing it. GS also acquires new weapons, since he lost them all in the ruins. 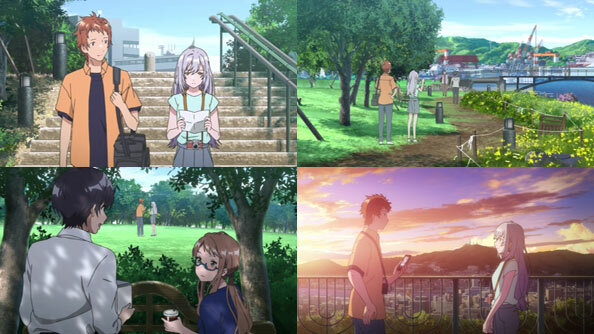 They share a sunset by the sea with a new invention called “ice creme” and after being chided earlier for being so taciturn with the Priestess, he actually opens up about that fear he once had to just take one step forward, lest the ground swallow him up. 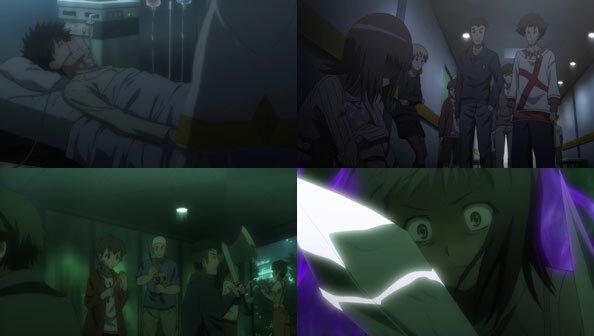 He’s still “scared to death” just like the Sword Maiden, and not amount of noble feats will change that. What changed was what they do with that fear, and how they keep living in spite of it. In both cases, neither would still be alive were it not for a little help from their friends. Back at the farm the cow girl assures her father that despite having been gone a long time, the GS will be back. Resurrection apparently doesn’t require much recovery time, since GS is back in action in the ruins with the rest of the party, after acquiring a mystery burlap sack from the Black Mage. 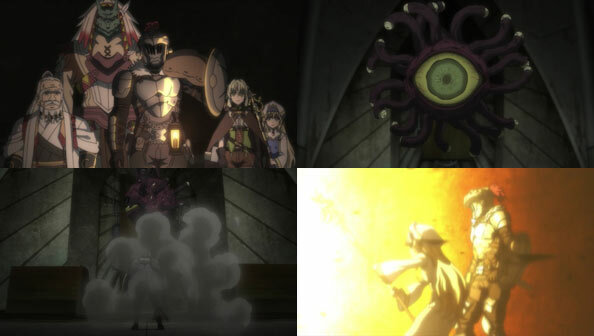 Their next big foe is not a goblin, but a “creature of Chaos”: a giant eyeball with tendrils coming out of it, each tipped with more eyeballs. Whenever something enters the room where it resides it blasts it with a stone-melting energy beam. GS knows he can’t just rush in and stab or blugeon the thing to death, so he formulates a game plan that requires the cooperation and coordination of everyone in the party. The Elf rushes in to distract the Eyeball, allowing the Dwarf to slip in and hit it with some sleep-inducing fire wine. Once GS empties the burlap sack—full of ultra-fine flour—into the room, creating a huge cloud of the stuff, the Elf shoots an arrow into the side of the eye, and then everyone retreats from the room, behind the Priestess’ Protection. The Lizard sends a Dragontooth Warrior in, which the Eye instinctively targets and fires its beam—igniting the flour like coal dust in a mine. The resulting explosion kills the creature, without the GS using fire, water, or poison. That leaves the adventurers standing before the thing it seemed to be guarding: some kind of magic mirror. I was a bit surprised so little time was spent without GS in the picture—the Priestess wasn’t even awake during that time—but considering the name of the show perhaps I shouldn’t have been. Not to mention this is a world of fantasy and magic in which death isn’t always irreversible. It was also good to learn a bit more about our boy, and for him to actually open up to the Priestess, who has certainly earned the right to know more, having saved him and all. 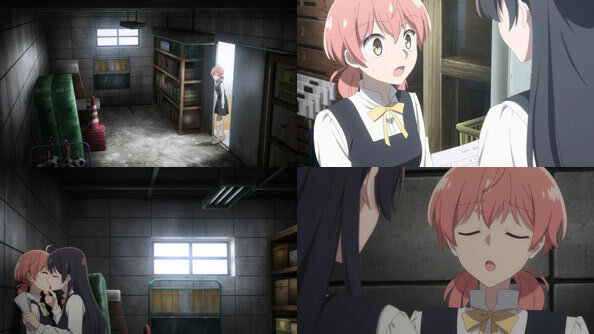 It’s a Lily episode! By which I mean, it’s a Gou Masao episode, since we learn that’s her birth name. 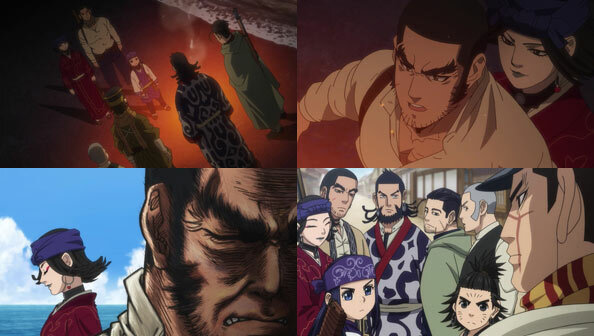 And it’s just as much a Gou Takeo episode, Takeo being Lily’s father. 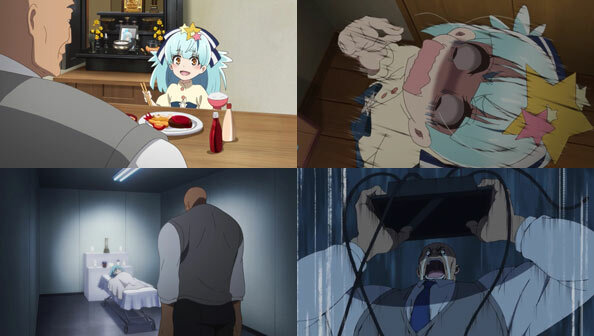 That makes this the first episode of ZLS that is at least partially told from the POV of a person who survived one of the members of Franchouchou. At first the show plays around with the idea this immense mountain of a man could simply be a creep, but I never bought into that angle. Instead I see his fatherly determination to confirm whether “Number 6” is really his Masao. 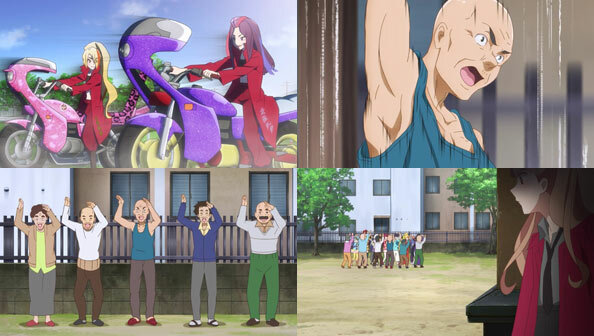 That enthusiasm earns him a rolling sobat from Saki, protecting her girls. But Lily later reveals to Sakura that the giant was indeed her father. Lily explains the vast size differential by saying she took after her mother, who died when she was very young. Her father raised her on his own, and when she noticed how much he loved TV, she signed up for auditions, got cast in one thing after another, and never looked back. However, Masao AKA Lily put so much stock in her tininess and cuteness that the day she found a hair on her leg she refused to go out and perform, and when she found a whisker on her face, she basically died of mental shock. 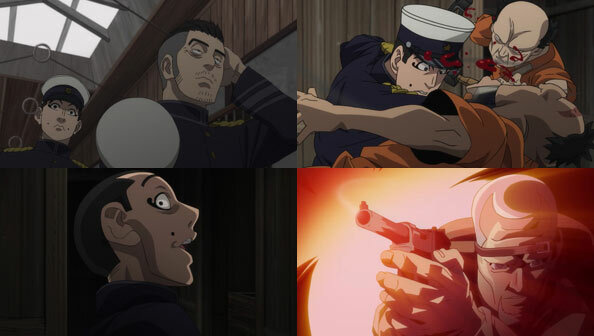 From Takeo’s POV, he was a bad father, pushing Masao too far. When he saw her smile appear posthumously on TV, he picked up the set and threw it at the wall, and ceased to watch any TV ever again. Lily and her dad’s next meeting is a lot more cordial as both apologize, but Lily doesn’t betray who she really is, and her dad doesn’t pry, convinced No.6 just looks like his daughter—besides, from where he’s standing, there’s no way she could just come back to life. His daughter is gone; he doesn’t want to cause some girl undue stress or harm just for resembling her. 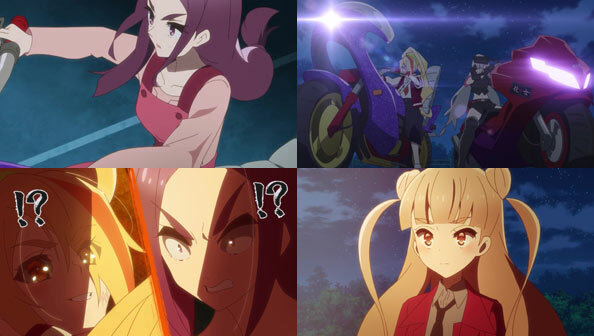 While Saki is the leader of Franchouchou, she’s always erred on the side of mocking Lily, both for her tiny stature and later for her butch real name and ridiculously vain way of dying. 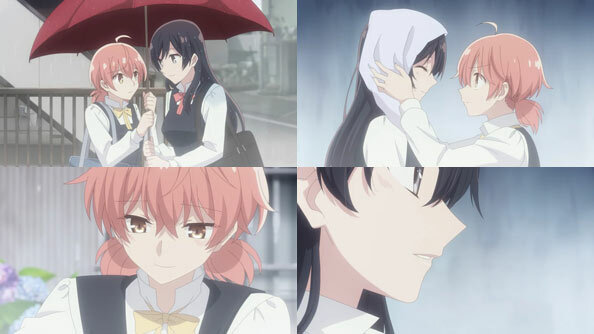 But Sakura has shown she’s much better with Lily, and in Sakura Lily finds the shoulder she needs to cry in after putting on a brave face for her dad. 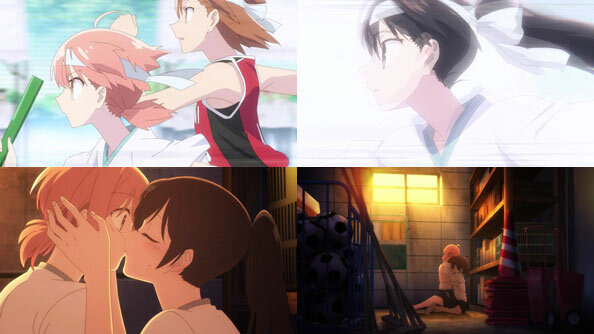 Sakura and the other girls put their heads together and get clearance from Tatsumi to hold a free public show and invite Lily’s dad, who almost doesn’t attend, but changes his mind at the last second. 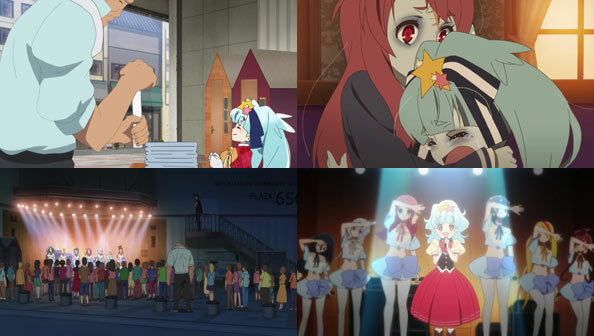 He’s then treated to a concert in which the other idols provide backup vocals and moves and Lily is in the spotlight. 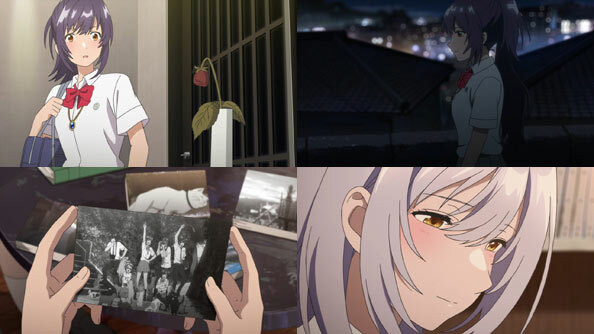 She sings a song with lyrics that, while perhaps a bit too on-the-nose and even kinda sappy, nevertheless successfully delivers her feelings to her father, even if he still doesn’t realize she’s really his daughter. The next time he’s at work, he doesn’t go out for lunch while his co-workers watch TV, which of course features that chicken commercial in which Lily appears.